Zietarski IT Consulting develops websites for small/mid-size businesses, single persons at affordable price and acts as solutions provider for midsize and bigger corporations. Zietarski IT Consulting possess experiences within various industries such are software development and web design in general, fashion industry, pharmaceutical, automotive, real estate and a wide range of software solutions partners in Europe. Currently I‘m working as a senior .Net Web Developer for Publicis Modem located in New York City. At Publicis Martin develops various web sites and backend solutions in ASP.NET MVC 4 including ASP.NET Web API for various mobile applications. When not developing software, Martin likes to hang out with his wife, play classic guitar or e-guitar, spend some time on a yacht. He can be contacted via www.zietarski.com. The motivation is the key - and the key is passion. I'm a big fan of Windows Phone 7 and Metro UI design - it was fascinating for me following the development and efforts done by Microsoft around WP7 for the past years. 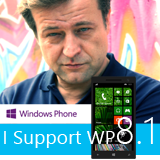 It became a goal for me to show this passion and support to Microsoft and WP7 in my newly redesigned website.